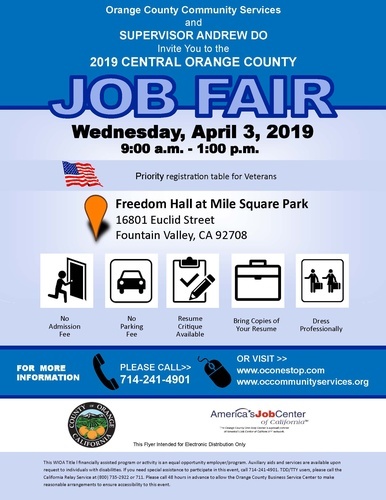 Orange County Community Services and Supervisor Andrew Do invite you to the 2019 Central Orange County Job Fair on Wednesday, April 3, 2019 from 9:00 a.m. to 1:00 p.m. at Freedom Hall at Mile Square Park. ​Priority registration table for veterans. For more information, please call (714) 241-4901 or visit www.oconestop.com or www.occommunityservices.org.